Throwing a party is all fun and games – until it comes time to clean. However, if you prepare and create a plan for tidying up the party aftermath, cleanup can become much less stressful. 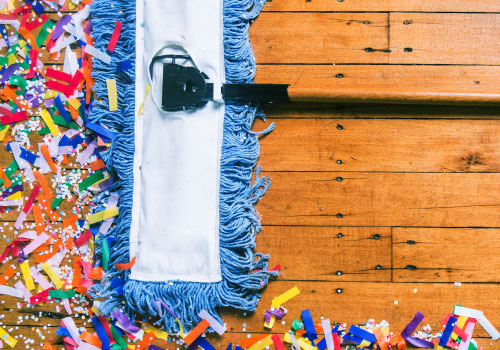 Whether you’re cleaning up after a tailgate party, birthday celebration or holiday gathering, follow these five tips to make the post-party cleanup a breeze. When it comes to the cleanup process, planning ahead helps create a sense of relief. After tending to initial messes like wiping up spills and storing perishable food items, make a to-do-list of your next steps to help you stay on task. These things could include cleaning the counter, vacuuming or taking out the trash. Check items off your list as you complete them to acknowledge your progress! Skip out on the hassle of disinfecting and cleaning silverware by using plastic silverware instead. With less serving ware to wash, plastic forks, knives and spoons are easy to buy in bulk, set out for guests and put in recycling bin after the event is over. Before the party starts, keep an open trash bag out for guests to throw away their disposable serving ware as they finish their meals. With Hefty® Ultra Strong™ drawstring trash bags, you don’t have to worry about bags ripping or leaking because they offer reliable strength with a break-resistant grip drawstring closure. Hefty® Ultra Strong™ drawstring trash bags also contain Arm & Hammer™ patented odor neutralizer to help fight nasty kitchen odors. Involve your children in the cleanup process by assigning them things to organize, clean or throw away. Create games out of tidying tasks or contests like who can pick up the most trash before a timer goes off. The active tear resistant technology in Hefty® Ultra Strong™ drawstring trash bags allows for a worry-free cleanup experience, as you can rest assured that the bags won’t rip or leak as your kids help you clean. To make cleanup as painless as possible, consider cleaning throughout your event. If an unexpected spill occurs or you find yourself with a minute to spare, wipe up or declutter simple things by loading the dishwasher or cleaning counters throughout the party. Cleaning as you go can be a huge help and offer you more relief by the time the party ends. Arm & Hammer, the Arm & Hammer logo and the distinctive trade dress are trademarks of Church & Dwight Co., Inc. and are used under license.